I love hearing my kids pray. I love the way my three year old thanks Jesus for very random things while praying for dinner. I love the way my 7 year old prays for our passed on loved ones to have a good time in Heaven. It’s precious, and so foundational to them making our family’s faith their own. My kids don’t often pray outside of the immediate. They pray for things like snow, sickness to go away, and for their behavior to improve. But, I want my kids to remember others in their prayers. I want them to pray for their friends, family, community leaders, and the leaders of our nation. 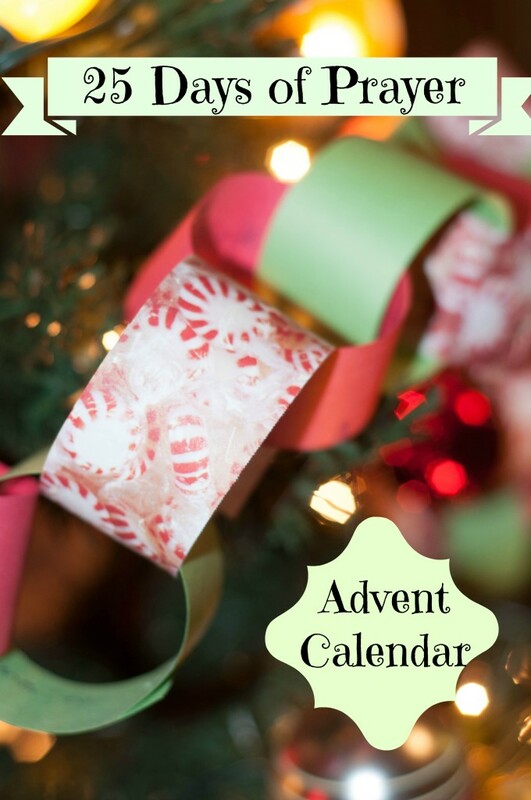 To inspire my children to pray daily and in broader strokes, I came up with a simple Prayer Advent Calendar. You’ve likely made a calendar like this before. We just added a simple but meaningful twist. To make, simply cut lengths of red and green construction paper. (You can use fancy scrapbook paper if you want to dress it up!) Write down one person/thing to pray for on each strip of paper. Fold each strip of paper into a loop, keeping the writing on the inside and secure with a staple or small piece of tape. Link the next paper loop through the first. Use one loop for each day. We used 24 loops/strips of paper – 8 strips in 3 different papers. You can easily adapt this calendar to include specific people, causes, situations, etc. I came up with a list to get you thinking. You may want to include causes and/or community/national/global situations. Use your best judgement as to what you’d like to share with your child regarding things going on around the world. If there are causes/situations that are dear to your heart, I would definitely include your children, and urge them to pray with you. You may also want to encourage your child to pray for things going on in their own life, if they do not regularly pray for their own needs. (It is something that is hard for many adults!) If you’d like, include things like their health, their behavior, things they struggle with, etc. Pull off one paper link each day during the month of December, and spend a few minutes each day praying with your child for the person or cause listed on the paper.